Quick Recap: I was all like,"TNG is crap!" Alan Doane was all like, "DUDE." And then he was all like, "Well what about these, douchenozzle?" And I was all like, "Okay, whatevs, I'll watch 'em." At least, that's how the conversation was reported by the History Channel. Oh, and by the way, Alan has started a new blog dedicated to Star Trek called Star Trek Galaxy. Check it out! When Lt. Jenna D'Sora breaks up with her boyfriend, she finds a possible replacement in her superior officer, the self-aware android Data. Intrigued by the notion of pursuing a romantic relationship and convinced it's an important stepping stone in his goal to achieve humanity, Data does his best to emulate a human partner. It surprised me how much I enjoyed "In Theory." Data's attempts at being a genuine boyfriend are often pretty funny, though the story pulls the rug out from under you in the end. Contrary to the usual course of these sorts of Data-as-tin-man episodes, the boundaries between Data and humanity are made perfectly clear. There is no smirking hint of hope that, just maybe, Data will realize his dream or that maybe in some small way he already has. "In Theory" ends with little ambiguity. This guy is a toaster oven. Deal with it. It's these Data-wants-to-be-human episodes that often bother me more than just about anything else in Star Trek: The Next Generation and the other Trek series. First, I doubt there's still anything new left to say about this robot wanting to not be a robot. Data's story was tweaked a little bit and copied not once but twice in Star Trek: Voyager with both The Doctor and his more attractive sequel, Seven of Nine. When someone finally found a way to do something interesting with Data in Star Trek: Generations - by giving him emotions coupled with the emotional stability of a toddler - it was quickly undone in Star Trek: First Contact by giving Data the ability to turn his emotions on and off with a little bend of his neck. Second, one of the things I enjoy most about Star Trek is the ingenuity its creators show in making such outlandish stories relevant to real people, and I don't see how the question of whether or not an android can force himself into becoming a real person is relevant to me. I know some people are genuinely worried about machines becoming more like real people, but I tend to see them as conspiracy theorists who are trying to come off as intellectuals because they saw Terminator. Third and finally, it's frustrating to me how the people around Data react to his lack of humanity. And in fact, while I enjoyed it, "In Theory" is a wonderful example. Lt. D'Sora constantly lectures Data about how humans do this and how humans do that. Throughout the series, different members of the crew complain to Data about how little he knows of what it's like to be human. This bugs me on two levels: A) It seems like an easy way for the writers of TNG to come off as deep, i.e. explaining what it's like to be human to a toaster oven will always impress the toaster oven B) How long have these idiots hung out with Data? Why are they still surprised and angry about the toaster oven being a toaster oven? That's why it's the ending of "In Theory" that really made it for me. His cold, obliviously uncaring reaction to his relationship with D'Sora ending was perfect. It was disarming, disturbing, and it was exactly what it should have been. Sometimes the universal translator just isn't enough. (Honestly since it's a device I've never seen and - after watching quite a few episodes of Star Trek and its various spin-offs, as well as all of the Trek films - am completely ignorant of where it's supposed to be located, it's a surprise the thing doesn't prove inadequate more often). Such is the case when the Enterprise meets with a Tamarian ship in orbit of the planet El-Adrel. While Picard and his crew can understand individual words from the Tamarians, their phrases seem like absolute nonsense. Likewise, the seemingly well-meaning Tamarians can't make heads or tails of Picard's words. The Tamarians shock the Enterprise crew by transporting their captain, Dathon, to the surface along with Picard while the Tamarian ship projects an energy field around the planet that prevents the Enterprise from beaming her captain back to safety. On the planet, Dathon invites Picard to what Picard believes is a violent duel. Dathon offers a knife to Picard which the federation captain steadfastly refuses. After a creature of shimmering, lightning-like energy attacks the pair, Picard begins to unravel what's going on. He realizes the Tamarian language revolves around story and metaphor. When Dathon offers Picard a torch to help him start a campfire, for example, rather than saying, "Take this," or something similar, the Tamarian says, "Temba, his arms wide," with Temba presumably being a figure in Tamarian myth or legend. Likewise, when Dathon first offers Picard the knife (and many times after) he says, "Darmok and Jalad at Tanagra." 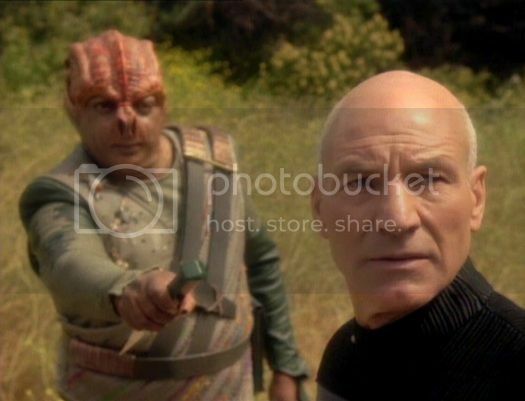 With Dathon's help, Picard concludes that there is a story in Tamarian legend of two hunters - Darmok and Jalad - who travel to the island of Tanagra and battle a beast. Dathon's intent, Picard realizes, was for the two captains to do the same and bring their cultures closer as a result. Unfortunately, by the time Picard gets a clue, Dathon is already mortally wounded. Aboard the Enterprise, Data and Troi work to solve the riddle of the Tamarian tongue while Riker exhausts every avenue to rescue Picard; wanting desperately to avoid combat with the Tamarian ship. Eventually Data and Troi come to the same conclusions as Picard about the Tamarian tongue, but since they don't know the stories upon which the Tamarian language is based, there's still no way to communicate. Feeling backed into a corner, Riker eventually attacks the Tamarian ship; hoping only to damage it enough to take out the energy field and beam Picard back to the Enterprise. They beam Picard aboard who, with his newly acquired understanding of the Tamarian tongue, manages to placate the Tamarians and relate the news of their captain's death. I enjoyed "Darmok" quite a bit. The idea of a race communicating completely through metaphor is fascinating and innovative. And overall it's refreshing to see the crew of the Enterprise deal with a breakdown in communication, especially since I've always felt ambivalent about the notion of the universal translator. On one hand you could certainly argue it may be a somewhat lame device, but a necessary one for the stories Star Trek's creators tell. On the other, I can't help but wonder if the franchise's stories wouldn't be much more interesting if the language barrier were intact. One thing about the premise can't help but bother me. I really don't want it to bother me, and instantly recognize it as the kind of problem I might sigh at if someone else mentioned it, but it's there and I can't deny it. The Tamarians seem unable to understand words unless they're used in reference to their stories. For example, they may understand the phrase, "Temba, his arms wide," but if you were to use the word "his" or "arms" or "wide" in another context, they'd be confused. If that's the case, if their language is composed completely of metaphor, then how were they ever able to tell the stories to one another in the first place? How could they ever learn the stories that make the foundation of their tongue unless they had some understanding of the words outside the context of their stories to begin with? I guess it could be a chicken-or-the-egg type deal, in which case I wouldn't necessarily call it a weakness. Real life is full of paradox. It's just something that needles at me a bit whenever I watch it. The Enterprise is caught in a time-loop. The same things keep happening. During a poker game, Dr. Crusher is called away to help Geordi in sick bay. Later that night she's disturbed in bed by a cacophony of muffled, ghostly voices. She tells Picard and the other officers about this during a senior staff meeting the following day and reveals there were other reports of Enterprise crew members hearing the same voices. The staff is called away from the meeting because of the discovery of a space-time anomaly. The anomaly takes out the ship's main power and another federation ship appears from the anomaly on a collision course with Enterprise. Since her thrusters won't respond, Riker suggests decompressing the main shuttle bay to move Enterprise out of the unidentified ship's path. Data suggests they shove the other ship away with a tractor beam. Picard goes with Data's advice and the unnamed ship hits Enterprise anyway. Picard has just enough time to order all hands to abandon ship before the ship explodes. And then it all happens again. And again. And again. Somehow, you're not bored. That's what most impressed me about the episode. Each trip around the loop starts right from the beginning; from the customary shot of the Enterprise slowly cruising through space and Picard's dictation of the log. But in spite of watching the same scenes play out repeatedly, it doesn't get stale. Throughout the episode I thought it was a testament to how much a different camera angle can change a story. Without those different angles, "Cause and Effect" would've seemed like little more than a broken VHS tape. Instead, it's an interesting, suspenseful episode. 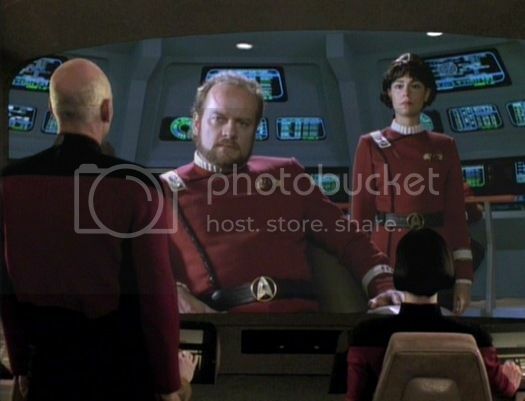 And as a cherry-on-top, Kelsey Grammer shows up as the time-lost captain of the other unnamed federation ship. Not that I'm a huge fan or anything, but it's just kind of cool. The episode ends with a "Hey look! Frasier!" Moments after the crew discovers an unidentified probe, Captain Picard collapses on the bridge. Less than a half hour later, he's lived a lifetime. After Picard falls unconscious on the bridge of the Enterprise, he wakes up in a humble, unfamiliar home. A woman called Eline claims he's her husband, calls him Kamin and says he's recovering from an illness. Initially, Picard clearly thinks the woman is behind something nefarious. His only concern is to find out where he is, who's behind his transportation away from his ship, and how to get back. Shortly after a cut back to the Enterprise, we return to the planet - Kataan (fellow board game geeks, calm down) - and some years have passed. And they keep passing. Eventually, Picard all but forgets the Enterprise. He learns to play the flute, has two children with Eline, and studies the planet Kataan, which he's convinced is dying. He is an old, forgetful man when his time on Kataan ends. Eline has died and his daughter has given him a grandchild. His daughter brings him out to watch the launch of the same probe Picard's ship encountered so many years ago; or what seemed like so many years ago to Picard. As Picard waits to watch the probe launch, dead friends and loved ones appear to him and finally reveal what's been happening. The people of Kataan died a millenia ago. Knowing their end was coming, they launched a probe that would keep the memory of their culture alive. While Picard has felt the passage of years, in reality his world is one the probe created in his mind. Once Picard revives on the bridge of the Enterprise, he's like a newborn or an amnesiac. He has to think to remember the names of his crew members and the ship seems like a dream. Of the TNG episodes on Alan's list that I hadn't seen before I started writing "Learning to Love Star Trek: The Next Generation," without contest "The Inner Light" has proven my favorite. It is more terribly and wonderfully bittersweet than any Star Trek episode has a right to be. Its power lay in something far too rare in the franchise: a focus on emotion and the human experience rather than examining the social, the political and/or morality. I'm not saying those things have no place in Trek. Clearly, the bold and powerful statements the franchise has made are an important part of the Star Trek legacy, but I think too often the notion of making the characters feel like real people who experience real things is forgotten. Half way through "The Inner Light," I was convinced that ultimately a global warming message was forthcoming, but that wasn't the case. There's no preaching or heavy-handed messages. In fact, it's made clear the people of Kataan were not responsible for their demise and that there was nothing they could do to change their fate. The episode isn't about melting ice caps or endangered species; it's about Jean-Luc Picard finding the kind of life being captain of the Enterprise denied him. It's about appreciating life, no matter where it takes you. And the last few minutes will break your heart. After the probe frees Picard from his virtual other-life, it deactivates. The crew retrieves the probe and later Riker brings Picard what was found within. You will know what it is before you see it, and it will break your heart.